I thoroughly enjoyed painting in the garden of a friend on Friday afternoon. 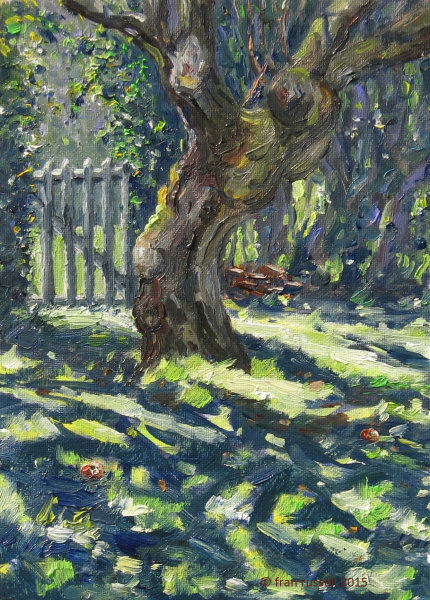 The weather was glorious which gave me a wonderful painting subject of an old apple tree with all of its wonderful shadows on the grass together with the back-lit gate and hedge behind the tree. It was a lovely subject in a beautiful place with such wonderful October weather. I had the company of lots of insects - including a stunning dragonfly who landed on my arm and stayed with me for quite a while. Like me they were all enjoying the very warm early Autumn weather. Oil on board, 7" x 5".